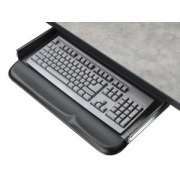 To ensure productivity and efficiency, it is important to equip work spaces with keyboard trays. What can make typing more comfortable? 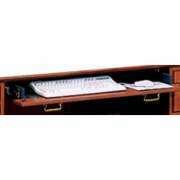 A keyboard drawer is essential for promoting healthy positioning and provides the added benefit of clearing space. 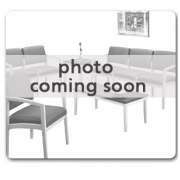 At Hertz Furniture, we know how important it is for professionals to be in a supportive work environment. A keyboard tray is one easy way to ensure that employees can remain task-oriented, rather than being preoccupied with physical pain or discomfort. When you provide ergonomic office furniture, you demonstrate that your company cares about comfort and health. How do I choose the right keyboard tray? In order to know how to choose the right keyboard drawer, it is necessary to have a proper understanding of healthy positioning for typing. The classic office desk setup, in which the computer and keyboard are positioned in a slightly-raised spot in front of the person is actually not ideal. When the keyboard is in front of the person seated at the desk, this often causes them to lean forward, which is not a healthy position to type in. Leaning forward for long periods of time can cause back and neck pain. Rather than positioning the keyboard directly in front of the monitor, it is preferable to have it in a lower position. 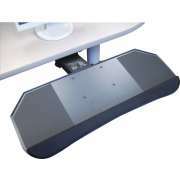 When the keyboard is below the desk surface on an under desk keyboard tray, the wrists can be in a straight alignment, rather than being tilted upward. With wrists in the correct position, workers are less likely to suffer from pain and discomfort as a result of typing. How can I save space on my desk? An added advantage of the keyboard tray, which should not be overlooked, is its space-saving function. With a separate tray or drawer for the keyboard, there is more space on the desktop which can be used for other necessary items and accessories. 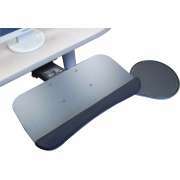 Additionally, when one is not typing they can easily slide the drawer under the office desk surface and adjust chair positioning for writing, reading or anything else that needs to be done. What kinds of keyboard drawers are there? 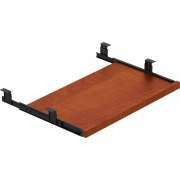 You can get a model-specific keyboard shelf as well as an articulating keyboard tray that can fit with almost any desk. 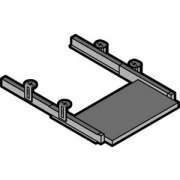 Drawers that are designed specially for particular models can often be found in the accessories section of that particular model. 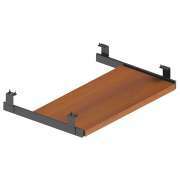 If you neglect to purchase the keyboard drawer at the time of desk purchase, one can still be ordered and installed subsequently. 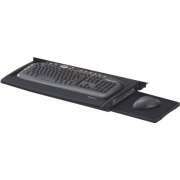 Universal articulating keyboard trays can turn virtually any workspace into an ergonomic office desk. 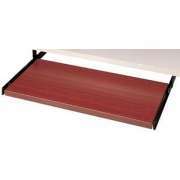 Whether you are using computer carts in schools or working in an office, a keyboard shelf will make the whole experience a much more pleasant one. 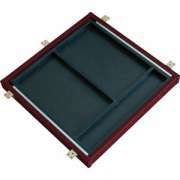 Keyboard trays can be adjusted in a number of different ways to provide a custom fit for any individual. 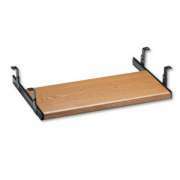 Among the options, an articulating keyboard tray is ideal because it is more flexible than a drawer which can only be pulled in and out without height or angle adjustment. What will happen if I don&apos;t get a keyboard tray? 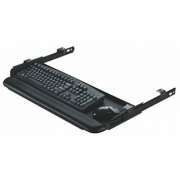 An adjustable keyboard tray is an integral part of proper positioning while working at the computer. If you are not positioned properly at the computer, you can get a repetitive-strain injury. In addition to being painful, this can also cost you a lot of recovery time and money. Having the right equipment from the beginning will cost less in the long run and keep employees more satisfied in the work environment. 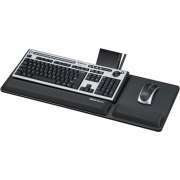 The ergonomic keyboard tray with swivel mouse pad from Systematix comes with a number of extra features that provide superior support. 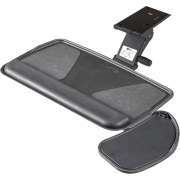 It comes with a built-in gel wrist pad for a cushy resting place whenever you are not typing. 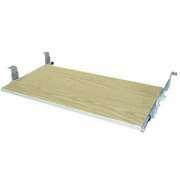 Additionally, the platform can be raised and lowered to find the healthiest, most comfortable position. In the modern business world, pretty much everyone who sits at a desk has a computer. 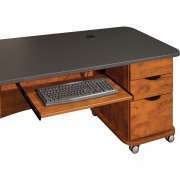 In order to ensure that everyone has a healthy and positive experience in the workplace, it is important to equip computer desks with keyboard trays. If you need help determining which keyboard drawer is appropriate for your company&apos;s desks, contact the Hertz Design Center for free help and advice.